I am so happy to say that Sarah from Sarahs cup of beauty, ( you can look at her lovely blog here- https://sarahscupofbeauty.wordpress.com ) nominated me for the Sunshine Blogger Award!!! Thank you Sarah! 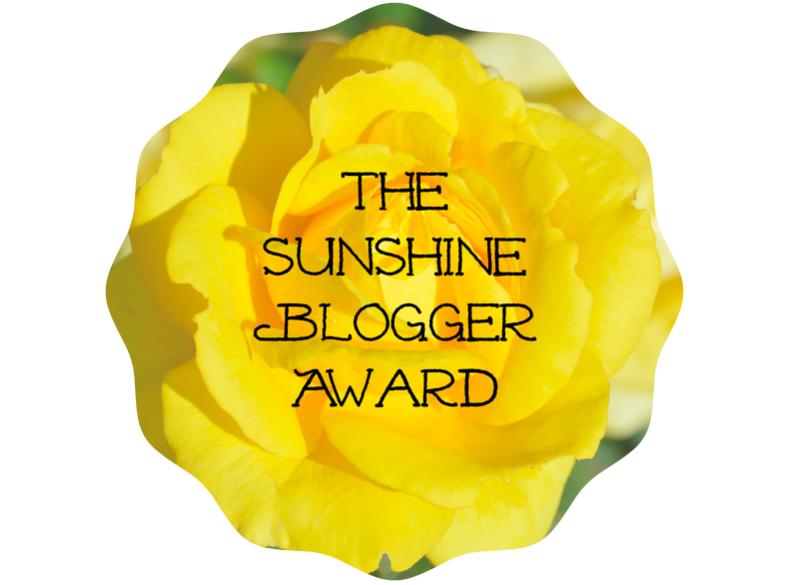 The Sunshine Blogger Award is given to a blogger who has been creative, inspiring and positive to read. Even though you aren’t actually receiving an award, but it is lovely to know that at least someone has been really your blog and enjoys what you are sharing. Display the Sunshine Blogger Award logo on your blog. 1) What are the characteristics of your ideal partner? They have to be respectful, caring and funny- as I like someone who can make me laugh! They can’t be afraid to be theirselves and try new things! 2) If the end of the world is nearing and you could escape with a space ship, which items would you bring with you? 3) When were you last excited about a purchase? 9th May, when I went to Bluewater for a little wonder. 4) What is your ideal vacation? A road trip around America!! 5) What do you think people notice first when they meet you? ermmmm, I would say my eyes, my dimple on my chin or how bubbly I am! 6) What activites in your life do you actually find a waste of time? I find all activities that I do productive as there is always a good end result. 7) What are your 3 goals this year? To become happier with my body by going to the gym, to focus more at uni and to pass my driving test. 8) What is your all time favourite food? I already know I am going to struggle with this question, as I love food!! but I love healthy food so much and also fatty food! I don’t think I can answer this question, but I’m going to give it a shot. Im going to say chilli heat wave Doritos! 9) What would you life be like if you’d have all the money in the world? OMG I WOULD SPEND SO MUCH ON UNNECESSARY STUFF! It’s actually laughable how I know this!! The thing is, I am very easily amused and I enjoy the little things in life, therefore if I see something cool like silicon cupcake cases then I am going to need to buy them, even though I don’t need them, but I want them. I would definitely spend money on makeup, because makeup is essential. I know I would be happy with all the money in the world, and I wouldn’t be one of these people who turns into a snob because they have money because I’m not like that. I would also give a lot to charities and try and help people as much as I can. 10) what is the most beautiful gift someone has given to you? This one came straight to my mind!- my boyfriend got a star named after me. To me that is such an amazing thing to get someone, as the stars are always going to be there. The idea of looking up at the stars and knowing I am named after one of them is beautiful. 11) what movie would you fear becoming reality? Any of the Freddie Kruger movies. 1) If you could be famous, what would it be for? 2) If you had a chance for a ‘do-over’ in life, what would you do differently? 4) If you could be an object or an animal, what would you be and why? 6) Do you have a Netflix account? 8) How would your friends describe you? 9) What do you do when you are bored? 10) Name 3 things you find beautiful. LASTLY, 11) what is your favourite quote? I hope you enjoyed this different post on my blog and maybe feel like you know me abit better. Previous Post REVIEW: TOO FACED SWEET PEACH PALETTE! Thank you so much for the nominee. I really appreciate it! I was noy expecting this at all and will pass it on as well. Loved your answers! I would love to travel around America too! I have only been to Orlando. The present your boyfriend got you is so precious. What a lovely, thoughtful gift! Well done on receiving the sunshine blogger award too! Can’t wait to read your next post! Sry lol. Can u delete this comment I meant to put it somewhere else. Congrats on the award! Loved reading your answers. It would be so freaking frightening if any of the Freddie Kruger movies come to life. Plus thanks for following me. Appreciate your trust in following me.